It was a busy morning at the base of Snowdonia, there were people all around, stretching and pulling and aimlessly muttering to each other. The sky was decidedly grey and the breeze was knocking gently against the rocks of the mountain around us. I couldn’t really think very clearly at all, my head was pounding from the headache that had been torturing me that morning and a tidal wave of sickness was consuming my belly but this was a start line and on a start line I do one thing and one thing only – focus. To roll back a little we have to go back about two months and my epic failing at the TG100, here you may recall I managed not to complete the race – my first and only DNF. 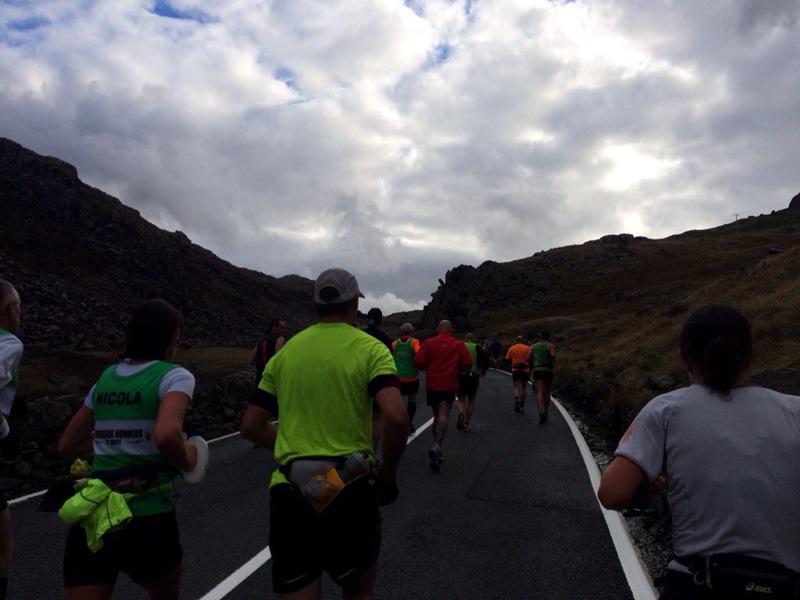 It was a combination of work being very busy, injury taking it’s toll, a hideously unlucky race day with the weather and a lack of training – it seemed that as I roll forward to the Snowdonia Marathon that I would be plagued by a similar set of circumstances. Just ten days before I was due to line up in the Welsh mountains I damaged my Achilles and with a long standing hip injury things didn’t look to cheery. However, if there’s one thing I’m full of it’s tenacity and I was going to run. My already limited training was cancelled completely, I stopped cycling and swimming and moved into a routine of icing and stretching at every opportunity – this had the benefit of soothing my aching Achilles and hips but wasn’t helping my preparation for distance. In a desperate bid for a pre-marathon event I signed up to Xtreme Beach and ran just one lap of the course (6km) before I felt the burn of my injuries and lack of fitness. There’s trouble at mill, I thought. It was all made even worse by the fact the only pair of shoes that didn’t pull or run on my Achilles was my much loved but over used Newton Distance. Now I love my Newton Distance but these bad boys had done more than 600 miles – the mesh fabric has started to tear and worse the sole has pretty much collapsed – these shouldn’t be run in. However, when I was packing my kit to head off to windy Wales I knew that they would be coming with me. 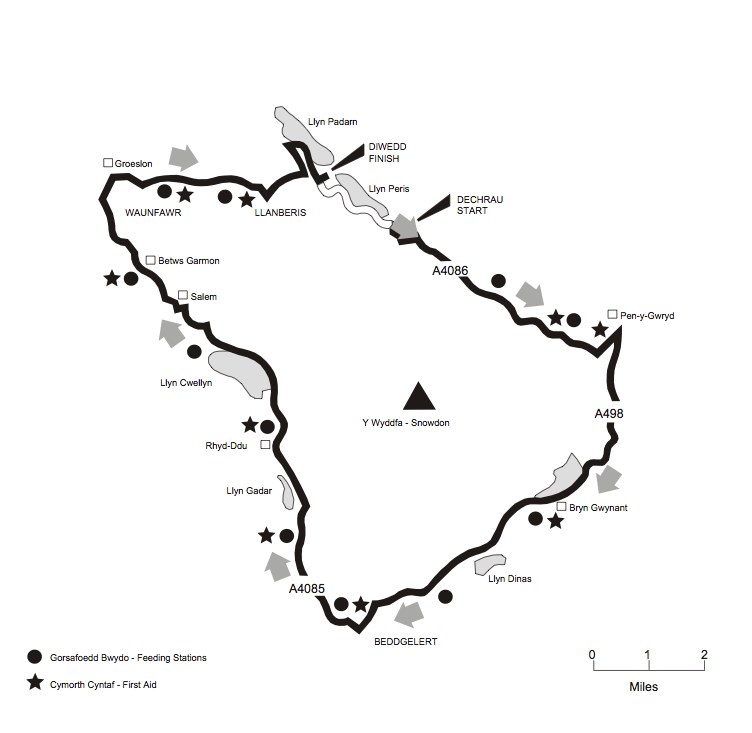 Anyway an 8hr car journey to Harlech in Wales later and I was cosying myself in a little cottage – only mildly concerned that the gale force winds would tear the roof off – still an early night, a decent dinner and I was ready for the race! ND: we won’t let you down, when have we ever let you down? ND: yes but even you agreed that was your fault and it was your dodgy toe that forced you into wearing us that day, we got you round! ND: look numpty boy, if you wanna race you’re going to have to wear me so stop this ridiculous conversation and slap me on UltraBitch! That’s perhaps not quite how it went but you get the idea. Anyway fellow bloggers and runners I arrived to the race village and drifted into the main hall, grabbed my number, avoided the cameras and went back outside to the car to get my bearings, take in some of the very vibrant atmosphere and chat with some of the runners. Most notably I met Gavin and his lovely family, he was a bit of veteran and aiming for about 4.15/4.30 as a finishing time and his view was that you take your normal marathon time and add about 30 minutes. In my head this meant that even with the injuries I could probably still run 4.45/5.00 as my average flat marathon time is about 3.30 and trail about 3.45 with a hilly marathon just over 4.10. Gavin and family provided a nice distraction and as we left each other I felt rather better than I had done all morning. With a need for some food I headed on into the Race HQ and picked up a delicious bacon and sausage bap – something to ease the queasiness and put a solid lining on my stomach for what is billed as the toughest marathon in the UK. As I sat down to eat over in the corner of my eye I saw the face of a man I recognised – someone I had never met but the reason that I run Ultra Marathons and the bigger distances, this was the man my other half really wanted to murder and not me. I strolled over to Tobias Mews, both a running legend and also a rather good writer – it has been my honour to occasionally design layouts for his writing and it was because I was reading his articles that I decided to become an ultra marathoner. I introduced myself and simply thanked him for introducing me to the stupid world of ultras and returned to my quickly cooling bacon and sausage bap. What a day it was turning out to be – filled with all sorts of good and bad things but meeting Tobias filled with further confidence that today was going to be a good day. The start was only about half an hour away and it was time for a few pre-race photographs (sadly not to be shared as UltraBoy likes his secret identity) and then off to the start. I hooked up again briefly with Gavin and his family and chatted about the upcoming challenge and also about football which distracted me from the slight rainfall that had started to come down but in my bones I could now feel the race energy swelling and all the injuries and excuses that had been shackling me where drifting away. The pre-race briefing bypassed me other than to not that we should smile for the cameras and I heard the sound of us leaving, my feet started off and the fury of pounding feet reverberated in my ears and surprisingly it was my own feet I could hear. It was a cramped start and actually it was a little difficult to get going but with the fire in my belly and knowledge that Kinder chocolate was in my pocket I proceeded to push my way through the groups of runners. 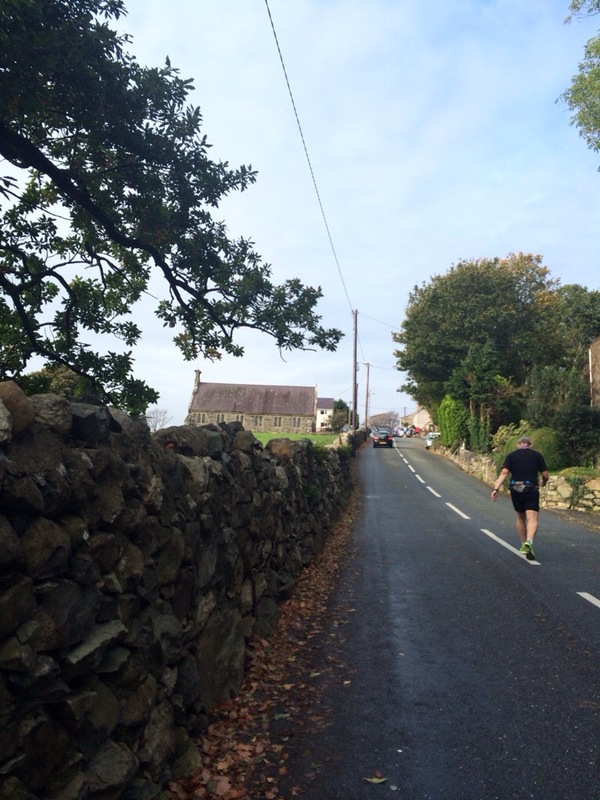 The Snowdonia Marathon has three big hills in it and the first comes very early on and I assume is designed to destroy your spirit but I was feeling surprisingly spritely as I forced one foot after the other. I even managed a few laughs and jokes with Batman and a couple of there other competitors, it was quite a jolly field. The first hill for me was probably the most amazing in terms of the view – it had all the drama and mystery I associate with the Wales of my childhood. Having pored over the course profile I was expecting this to be challenging but what I hadn’t expected was for it to feel unrelenting, what kept my, and I suspect everyones, spirits positive was the knowledge that there was a significant downhill to come. As I reached the top of the first challenge I could see the runners in front of me dipping below my vision, clearly pelting away and I did much the same. For the first time in the race I stretched the muscles in my arms and legs, pumping away, looking down into the vastness below – wonderful and I was 10km in and only 55 minutes had elapsed – I was in good form. I passed by the turning at the bottom of the hill and there I was greeted by the very cheery face of Richard, the manager from the Dartford Sweatshop who I hadn’t seen since we ran a bit of the WC50 together – we chatted briefly as he ran alongside me and he wished me well and I left him behind awaiting the arrival of his other half! Onwards I hit the trail and left behind the steady path and used this as an opportunity to bounce around a bit, have some fun, race a bit and continue my usual chitty chattiness that I enjoy on a raceday. My only problem was one of a Paula Radcliffe/Call of Nature… I was hoping for a portaloo on the route but it never came and for a while it was all I could think about but clearly it must have focused the mind because when I saw the lovely toilets I was at mile 12 and even with an eight minute stop I still managed the first half in just under two hours. As the course continued it was a very light incline we were treated to and this posed few problems but the second of the big hills was a huge challenge, probably only as steep as the first but with people walking it felt like a much bigger task and do I slowed to a speed walk and used my ultra training method of dealing with the hill – walk it quickly. This got me to the top of the hill and I was away again, a little Kinder chocolate and some fruit strings and I felt pretty fresh. It was about mile 14 where things changed for me, I was meandering round the course, trying primarily to ignore the pain on my hip, keeping hydrated and chatting to fellow runners and here I met Grant. Let me start by saying Grant is either a hero or madman, probably both because he entered the race with only three months training behind him and had this as his first marathon. Surprisingly he wasn’t carrying any hydration and had unfortunately at the halfway point started to feel the burn of his knees – we’ve all been there, we know what it’s like but this seemed a new experience to him and given that his longest distance had been 16 miles (I’m sure you can confirm this fella!) I wasn’t sure he would make it without some support. Being rather jovial company we decided to run together for a bit but after a while it occurred to me that he’d come out of the blocks too quick and I suggested we stayed together to ensure we both finished a very tough course. As we came to mile 18 Grant was feeling his knees increasingly but he continued to make steady progress through the course and only once did I see his head drop and so hopefully my few words of encouragement got him through the moments of anguish and together we strode up the final hill, working together to make sure we didn’t lose sight of the prize. The final hill was an amazing experience and had circumstances been different it would have been fun to have run but our steady progress meant we reached the summit and were able to run the next couple of miles and along to the final water stop. With time ticking away though and daylight disappearing the weather also took a turn for the worse and rain began pelting down and with a whipping wind it became a harsh course. Grant had, it seemed, won the mental battle to get to the finish – he wasn’t going to stop now and he looked visibly more positive, even if his knees hurt like hell. For my part I felt fresh and light on my feet and as we pulled in to the final water point something else happened – Grant was having a water stop and a young lady – Julia rocked up looking frozen and in dismay. She spoke to the marshall but she was barely audible on the hilltop and the marshall asked if I could talk to her. It turned out she was so cold and weak that she felt she couldn’t go on – mile 23 and a bit! I asked her what was wrong and she explained she was feeling light headed and cold, with a bit of effort I undid her jacket from her waist and got her covered up, gave her Kinder chocolate and some water and both Grant and I offered to stay with her to make sure she got to the finish. We made our way slowly down the final hill, we could see the finish in the distance. Grant was slowing further but I knew that it was our new running buddy that needed the support and with just a mile to go I turned to see Grant and make sure he wasn’t going to stop and asked Julia if she was capable of running. Now warmed, watered and chocolated we set off at a fearsome pace and as we approached 800metres to go I waved goodbye to Julia aswell, safe in the knowledge she wasn’t going to stop. Both feet now lurched forward, cries of ‘great finish!’ welcomed me and I thrust my chest forward and pumped my arms to my traditional sprint finish, the line was in the distance and with every ounce of my strength I flew under the giant red inflatable. I had done it. 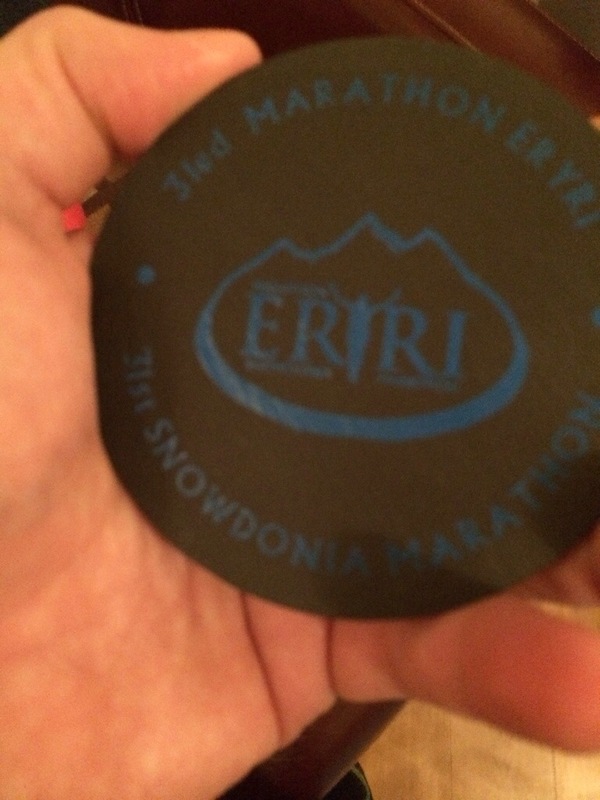 Grasping my new slate memento I thrust it aloft and growled, despite a reasonably poor time I was happy I had finished the Snowdonia Marathon. The race was actually tough but far from impossible and infact I found this a rather endearing course and will in the future be back to complete it in a faster time when less injured and more prepared. The course was in places in beautiful but as with all 26.2milers there were sections that were a little bit dull but overall you wouldn’t complain about the quality of the vistas. 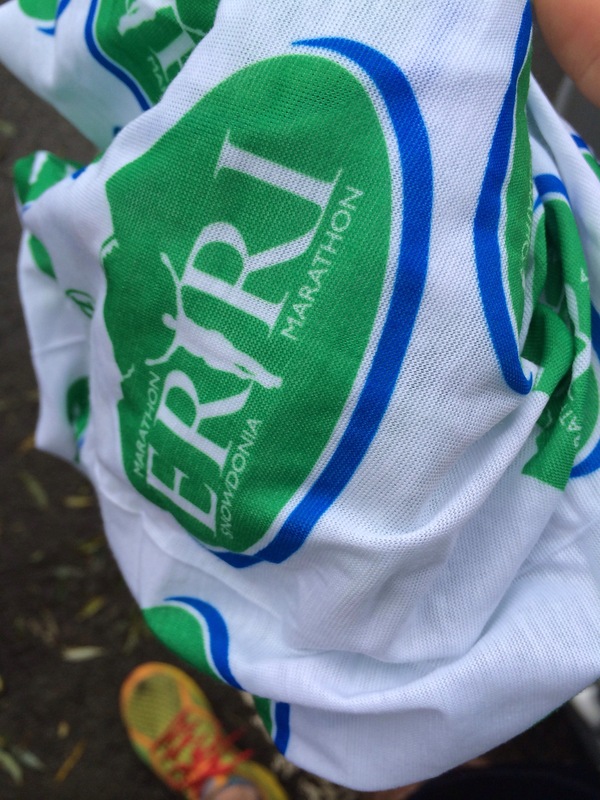 The atmosphere was electric at times, the support was fantastic almost all the way round and you could feel the quality of the field you were amongst – almost every person had trained properly and everyone was ready for a marathon. There was generally ample water on the course and more than enough gels (though I’m not a gel fan), only one of the water stops was bereft of water, but this was a fairly vital stop, at the top of a hill and a number of the runners really felt the lack of water here – I was grateful I was carrying my own supply (and yes I did offer to share it where needed :)). The goodies were surprising, the first was the excellent T-shirt which has been worn several times and although no medal there was a branded slate coaster, which while not amazing will provide an excellent momento of a great race. At the race finish though I was disappointed to note that there was no fruit, cake or sweeties – just a bottle of water and that was not what I wanted – I wanted chocolate. 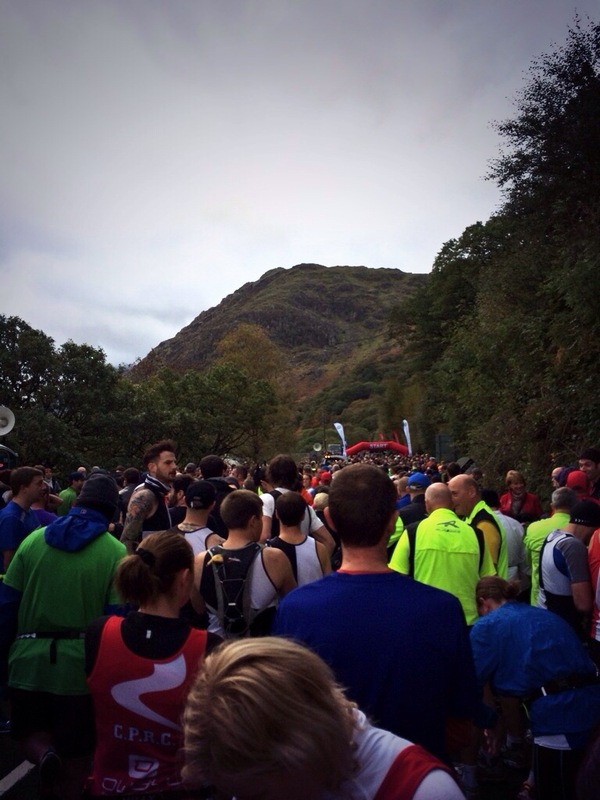 Do this race, you won’t regret it but it wasn’t what I was expecting – perhaps that is half the fun of it.